First rendezvous of two spacecraft. Originally was to dock with an Agena target, but this blew up on way to orbit. Decision to rendezvous with upcoming Gemini 7 instead. Mission almost lost when booster ignited, then shut down on pad. Launched: 1965-12-15. Returned: 1965-12-16. Number crew: 2 . Duration: 1.08 days. Location: McDonnell Planetarium, Saint Louis, MO. The primary objective of the mission, crewed by command pilot Astronaut Walter M. Schirra, Jr., and pilot Astronaut Thomas P. Stafford, was to rendezvous with spacecraft No. 7. Among the secondary objectives were stationkeeping with spacecraft No. 7, evaluating spacecraft reentry guidance capability, testing the visibility of spacecraft No. 7 as a rendezvous target, and conducting three experiments. After the launch vehicle inserted the spacecraft into an 87 by 140 nautical mile orbit, the crew prepared for the maneuvers necessary to achieve rendezvous. Four maneuvers preceded the first radar contact between the two spacecraft. The first maneuver, a height adjustment, came an hour and a half after insertion, at first perigee; a phase adjustment at second apogee, a plane change, and another height adjustment at second perigee followed. The onboard radar was turned on 3 hours into the mission. The first radar lock-on indicated 246 miles between the two spacecraft. The co-elliptic maneuver was performed at third apogee, 3 hours 47 minutes after launch. The terminal phase initiation maneuver was performed an hour and a half later. Two midcourse corrections preceded final braking maneuvers at 5 hours 50 minutes into the flight. Rendezvous was technically accomplished and stationkeeping began some 6 minutes later when the two spacecraft were about 120 feet apart and their relative motion had stopped. Stationkeeping maneuvers continued for three and a half orbits at distances from 1 to 300 feet. Spacecraft No. 6 then initiated a separation maneuver and withdrew to a range of about 30 miles. The only major malfunction in spacecraft No. 6 during the mission was the failure of the delayed-time telemetry tape recorder at 20 hours 55 minutes ground elapsed time, which resulted in the loss of all delayed-time telemetry data for the remainder of the mission, some 4 hours and 20 minutes. The flight ended with a nominal reentry and landing in the West Atlantic, just 10 km from the planned landing point, on December 16. The crew remained in the spacecraft, which was recovered an hour later by the prime recovery ship, the aircraft carrier Wasp. On launch day for the Agena target vehicle - 25 October - at pad 14, a team from General Dynamics Corporation conducted the countdown of the Atlas launch vehicle capped by the slender Agena. Although this would be its maiden voyage in Project Gemini, Agena was a veteran, in one model or another, of more than 140 flights since 1959, The countdown, presided over by NASA Mission Director William Schneider, proceeded simultaneously for the Atlas, Agena, modified Titan II, and spacecraft. Noticeably absent were the delays that had plagued Mercury launches. Fifteen minutes before the Atlas-Agena was to leave its moorings, Schirra and Stafford climbed into the spacecraft and settled into their couches. At 10 o'clock, General Dynamics launch chief Thomas J. O'Malley pushed the button that sent the Atlas-Agena skyward. Signs that something was wrong appeared minutes later when the target cut loose from the booster. The Agena seemed to be wobbling, even as its attitude control system labored to keep it stable. The small secondary engines ignited and the gas generator valve opened to fire the main engine and boost the Agena to orbit. A telemetry signal in the Mission Control Center showed that the big engine had started exactly on time. But that was the last good news. In Houston, Schneider, who thought Agenas always flew, was astounded to learn there was a problem. In fact, Air Force radar was tracking what seemed to be five pieces of the target vehicle. In the meantime, Public Affairs Officer Paul Haney, trying to keep the public informed, had little or nothing to report. Ten minutes after liftoff, he could only repeat that no telemetry signals were coming into the stations along the flight control network and that, over on pad 19, Schirra and Stafford were continuing their preparations for flight. After 50 minutes, the last flicker of hope gone, Haney told his listeners, "We have had a conversation with the Carnarvon tracking station, . . and their report keeps coming back - No joy - No joy." The mission was scrubbed. Actually, only six minutes after launch, a deadening sense of failure was spreading among those closely connected with the target vehicle's development. Jerome B. Hammack, who kept tabs on the Agena for GPO, was in the pad 14 blockhouse, listening to the flight controller's comments. He was soon convinced that there was deep trouble. The Air Force officer in charge of Atlas-Agena launches, Colonel L. E. Allen, thought the Agena had probably exploded. The two men headed for the Lockheed hangar, where others also gathered for the wake. Hasty study of partial telemetry data threw little light on the cause of the disaster, but newsmen were clamoring for a press conference.NASA and Air Force officials told reporters that they did not know exactly what had caused the failure, but that ten days might be enough time to decide what to do to keep it from happening again. The gloom that descended upon Gemini was quickly pierced by a ray of hope. While the futile countdown for the spacecraft launch was still under way, Frank Borman rushed from the outside viewing stand to the Cape Kennedy Launch Control Center to find out what had happened. He found himself standing with Gemini VII crewmate James Lovell near two McDonnell officials, spacecraft chief Walter Burke and his deputy, John Yardley. The astronauts heard Burke ask Yardley, "Why couldn't we launch a Gemini as a target instead of an Agena?" Yardley recalled that the Martin Company had proposed a rapid-fire launch demonstration some months before. He asked Raymond Hill, now in charge of McDonnell work at the Cape, what he remembered about the study. Hill briefly outlined the plan, and all three began discussing how it could be adapted to carry out Burke's idea. Borman listened with growing excitement as the McDonnell idea jelled. What he heard made sense, with one exception. When Burke began to sketch on the back of an envelope how an inflatable cone could be attached to Spacecraft 7 to permit docking, Borman drew the line; he disliked the thought of anything nuzzling into the equipment housed in his spacecraft's adapter section. Burke and Yardley found NASA manned space flight chief George Mueller and Gemini Manager Charles Mathews and tried out their scheme on them. Neither NASA official gave it much of a chance. The two McDonnell engineers left the building to see if they could sell their concept elsewhere. Burke's brainstorm was built on more than just a vaguely recalled Martin proposal. Shortening the launch intervals to two months had proven that hardware could be put into the pipeline faster than in the past. But if Gemini VII were to be the target for Gemini VI, the two vehicles would have to be launched less than two weeks apart. Mueller and Mathews simply refused to believe that it could be done. Ironically, they were the prime movers in urging shorter schedules: but Burke's idea far exceeded their expectations. In September 1964, Mueller had asked Schneider if he thought activating a second lain rich complex would help to shorten the time between launches. Schneider's first reaction was no. But, in February 1965, he had his office study the value of launching two Gemini spacecraft either simultaneously or in quick succession. Eldon W. Hall, Schneider's Systems Engineering Director, reported that having two crews in orbit at the same time and trading pilots in mid-space would have public appeal. Other advantages might be using an unmanned Gemini for a space rescue or completing a rendezvous mission if a spacecraft failed to launch. But none of these things was worth the cost of a second pad and spacecraft modifications. In summary, Hall said, "It might be nice, but there is no overwhelming necessity." Mueller seized every chance to push for shorter launch schedules and new objectives to wring added experience from the Gemini program, especially for Apollo. In Houston, Mathews kept his staff on the lookout for new ideas for the missions. He had helped Hall with the report and agreed that the expense would be too great. Mathews did, however, arrange to procure spare parts for pad 19 so it could be swiftly restored after a launch. Because of the daily contact between NASA, the Air Force, and contractors, ideas for speeding up the program flowed freely at the Cape. One of these - a rapid turnaround of the launch vehicle - was the result of collaboration between Joseph Verlander, Martin chief at Kennedy, and Colonel John Albert, Chief, Gemini Launch Vehicle Division, 6555th Aerospace Test Wing. They proposed getting a fully checked Gemini Titan ready for launch and then parking it somewhere while a second launch vehicle was prepared for flight. One problem was how to move the first booster, since the engine contractor, Aerojet-General, insisted that the vehicle had to remain upright once it had been erected and checked out. The answer to that was a Sikorsky S-64 Skycrane, a helicopter powerful enough to lift and carry the upright Titan II. It was really quite a simple plan, though carrying it out might involve a lot of complexities. After a booster and spacecraft had been checked out in the usual manner, the spacecraft would be transferred to bonded storage and the launch vehicle would be hauled by helicopter to nearby pad 20, which was not in use at the time. Then a second booster and payload would be readied on pad 19 and launched. The stored and parked vehicles would be immediately returned to the pad and launched in five to seven days. No one seemed interested in the Gemini "rapid fire," or "salvo," proposal except its creators. When Verlander told O.E. Tibbs about it, the Martin vice president frowned on the idea of using the Skycrane helicopter. Albert outlined the plan to SSD Commander Ben Funk and SSD Director of Gemini Launch Vehicles Richard Dineen but roused only mild interest. Burke and Yardley listened politely but did not seem impressed. Mathews told Verlander and Albert frankly that there was no place in the Gemini program for such an unorthodox suggestion. In August 1965, Albert took the scheme to Gemini V Mission Director Everett E. Christensen, but he received no encouragement there, either. This lack of enthusiasm was daunting, and the Martin plan seemed destined for limbo. Two months later, however, in the aftermath of an exploded Agena, the idea looked better, at least to Burke and Yardley. But they got no warmer reception than Verlander and Albert. Failing to sway Mueller and Mathews, they left the Launch Control Center for the Manned Spacecraft Operations Building, where an impromptu meeting on what to do next was in progress. Here they again urged their scheme, but, as Merritt Preston, the Kennedy launch operations manager, later said, "Poor Yardley and Burke were pounding a stone wall . . . they got the coldest shoulder I ever saw." People at the meeting were more interested in the possibility of switching the 3,670-kilogram Spacecraft 7 with the 3,553-kilogram Spacecraft 6. Albert and others - among them some of the very men who had fathered the rapid turnaround plan - favored the proposed exchange. Having been rebuffed earlier, they now thought more conservatively. They reasoned that some of the time and work invested in Gemini VI launch preparations might be retrieved by using the booster already on the pad and checked out to launch the long- duration spacecraft. Burke and Yardley, on the other hand, pushed for removal of both the spacecraft and the booster, hoping to buy time for their proposal to be given further consideration. But the NASA, Air Force, and industry launch teams wanted to wait and see if GLV-6 had enough power to lift the heavier Spacecraft 7 into orbit. Mueller called NASA Administrator James Webb in Washington shortly after the Agena explosion and told him about the idea of exchanging spacecraft. Webb discussed it the next morning with his chief associates - Deputy Administrator Hugh Dryden, Associate Administrator Robert Seamans, Associate Deputy Administrator Willis Shapley, and Mueller, now back from the Cape. If the switch could be made, the earliest launch date would be 3 December. If GLV-6 were not powerful enough to lift Spacecraft 7 into orbit, then the launch would take place on 8 December. Gemini VI, postponed to February or early March, would still fly before Gemini VIII. There was no mention of the Burke-Yardley proposal. Having made little headway at the Cape and with the spacecraft exchange plan gaining support, Burke and Yardley had headed for Houston to broach their idea to MSC Director Robert Gilruth. On Tuesday morning, 26 October, while Webb and his colleagues were talking about exchanging the two spacecraft, Gilruth listened to Burke. smiled, and said, "Walter, you know things aren't like that in real life." Burke shot back, "Tell me what's wrong with it." Gilruth could come up with no convincing obstacle. He called George Low in to help him nitpick. The Deputy Director was intrigued by Burke's scheme. His only real doubt was whether the tracking network could handle two manned spacecraft at the same time. But that was a question for Flight Operations Director Christopher Kraft. In the meantime, Mathews had arrived in Gilruth's office. He was no more able than Gilruth or Low to think of any insurmountable barrier to the plan. Gilruth asked Kraft to join them and show them the operational roadblocks that must he there. Taken aback, Kraft first said, "You're out of your minds. It can't be done." After thinking a few moments, though, he was not so sure. He called Sigurd A. Sjoberg, his deputy, to set up a meeting with his flight operations experts for 1:30 that afternoon. Flight Crew Operations chief Slayton was the next to hear the news, and he, in turn, sounded out the pilots for their reaction. Schirra and Stafford greeted the prospect with enthusiasm. In Florida, hopes for switching the spacecraft faded when an analysis of GLV-6 showed that it lacked the power to orbit the Borman-Lovell spacecraft. At a meeting in the office of John Williams, Director of Spacecraft Operations, the Cape leaders were now forced to consider the Burke-Yardley suggestion they had scorned before. As they tinkered with a tentative work schedule for a nine-day pad checkout, they began to see glimmers of light. Merritt Preston telephoned Mathews in Houston and LeRoy Day in Washington and told them it might work, after all, as far as the machines were concerned. Day found that Mathews was now in favor of the plan. Hardware was apparently no obstacle, but tracking and control operations were still a question mark. Kraft came back from lunch with Low and outlined the gist of the proposal to his staff. The men in John Hodge's Flight Control Division found it "a hell of a great challenge and to a man they wanted to press on as soon as possible." One of them suddenly said, "Why don't we handle it as if one of the spacecraft were a Mercury-type and the other a Gemini-type spacecraft?" Mercury controllers at the tracking stations observed data on their consoles, summarized it, and forwarded the result by teletype to Mercury Control Center. Gemini VII could be handled that way while it served as a passive target for Gemini VI. For Gemini missions, the stations were fitted with computer communications processors. As the spacecraft passed overhead, the processors interrogated the appropriate systems for specific data, which were automatically transmitted to Mission Control. Gemini VI, the active partner in the rendezvous, would be controlled by the more sophisticated system. With this as a basis, an operational mode was laid out. After Gemini VII lifted off, flight control would be carried out in the normal manner while the pad was being prepared for the second launch. Once the flight controllers were sure the orbiting spacecraft was operating properly, Mission Control would concentrate on Schirra and Stafford in their spacecraft, and the tracking network would watch Gemini VII, record data, and send information by teletype to the Houston controllers. This mode would continue until the complicated rendezvous mission ended and Gemini VI-A (so called to distinguish it from the originally planned mission whose objective had been rendezvous with Agena) returned to Earth. Then Gemini VII would become the focus of communications again. Kraft was soon convinced that the operation could be carried out safely. He told his Mission Planning and Analysis Division to set up the flight plan so the second launch could take place as soon as the pad was ready. At 3 o'clock that afternoon, Kraft told Gilruth that he was ready to talk, and he sounded excited. An hour later, Gilruth, Low, Mathews, Slayton, Burke, and Yardley heard what Kraft had to say. They talked about it for an hour, then Gilruth called Mueller, who liked the dual control idea but wanted to sleep on it. Burke and Yardley left for St. Louis with a promise from Gilruth to let them know within 24 hours what Headquarters decided. But the news was beginning to leak out. James C. Elms, Mueller's deputy, heard from Washington reporters that there were rumors that NASA was going to fly two manned spacecraft at the same time. He p honed Houston to ask Low what was going on. When Low had told him about the plan, they decided to warn Mueller about the danger of news leaks. Realizing that speed was now vital, Mueller called Seamans at home. It was too late to do anything that evening, and Seamans asked Mueller to come over the first thing in the morning to discuss the subject. Although Seamans was very interested in what he heard on Wednesday morning, he told Mueller to keep it quiet until he could pass it along to Webb and Dryden. That afternoon, 27 October, Webb, Dryden, Seamans, and Shapley met to discuss the Burke-Yardley proposal. Because Dryden had been concerned about adding extravehicular activity to Gemini IV at the last minute, Seamans felt he had to play devil's advocate. Even before Seamans finished, Webb was intrigued. Believing himself to be less conservative than Seamans about novel ideas, however, Webb telephoned Mueller and asked him point-blank if it would work. Mueller asked him to wait while he double checked with Gilruth in Houston. Mueller told Gilruth that Webb liked the idea and thought it important enough for the President to announce. Mueller warned the MSC Director that there could be no hedging. Once President Johnson made the plan public, the nation would be committed. How, Mueller wanted to know, did Gilruth feel about the proposal after thinking it over for 24 hours? Affirming that it still looked good to him, Gilruth nevertheless asked for half an hour to count the votes. Mueller gave him 15 minutes. Gilruth and Low polled Kraft, Slayton, Mathews, and Preston, stressing what a presidential announcement implied. When the affirmative ballot was unanimous, Gilruth called Mueller, who notified Webb that he had a deal. Webb then tried to reach presidential aide Jack Valenti but talked with Joseph Laitin, an assistant, instead. Laitin asked the Administrator to send the proposal to the White House so it could be forwarded to the President who was at his ranch near Austin, Texas. Webb drafted a memorandum for the Chief Executive, while Julian Scheer, NASA Assistant Administrator for Public Affairs, composed a press release. The NASA chief informed the President that, barring serious pad damage after the launch of Gemini VII, Gemini VI-A could be flown in time for Schirra and Stafford to rendezvous with Borman and Lovell. Webb told President Johnson, "I believe it will be encouraging to you . . . to learn that we have gained enough strength in . . . the Gemini program to consider. . . such a quick turnaround." On Thursday, 28 October, a press conference was held at the Texas White House to announce the Gemini VII/VI-A rendezvous mission. That a plan of such scope could be suggested, discussed, approved, and announced in scarcely three days was a sign of the managerial and technical trust that Gemini had already come to inspire. William D. Moyers, the President's Press Secretary, told the news media about the plan and answered questions from reporters. Moyers said the mission was targeted for January; back at MSC, however, everyone from Gilruth on down was working toward an early December flight. At Cape Kennedy, normal methods now had to be suspended. From the hardware standpoint, success depended upon the performance of the launch preparation teams. Members of the NASA, Air Force, and Aerospace teams met and agreed on the best way to implement the plan. In this emergency situation, Aerojet-General engineers came through with procedures for handling the vehicle in a horizontal position, even though they had said earlier it must not be done. The Air Force's 6555th Aerospace Test Wing took GLV-6 down, one stage at a time, and placed it in bonded storage under plastic cover. On 29 October, the team erected GLV-7 on pad 19. Spacecraft work began when the McDonnell Cape team was rounded up to hear about the new mission. "Oh, man, you are crazy!" was the first reaction of pad leader Guenter Wendt when he saw the "S/C #6 Pad Schedule," which listed tasks for nine hectic days after the Gemini VII launch. But he, like everyone else, tackled the challenge enthusiastically. While these exact schedule details were being pinned down, Spacecraft 6 was secured in a building on Merritt Island. Crew training presented no serious problems. Schirra and Stafford were honed and ready to go. They stepped aside while Borman and Lovell flew the simulator, taking only occasional sessions to keep sharp. Rendezvous plans remained unchanged. But Gemini VII's flight plan was altered to circularize the orbit, so Spacecraft 1 would travel in the same path that the Agena would have used. Although Kraft's group had a workable concept for flight control, the operations experts still had a lot of work ahead setting up simultaneous controls for two manned spacecraft. Goddard Space Flight Center, in charge of the tracking network, began altering station layouts to allow voice communications with Gemini VII and VI-A at the same time. Equipment at Goddard was also adjusted to ensure that computer programs for two manned spacecraft could be prepared. Schirra and Stafford wanted to add extravehicular activity to the flight plans - perhaps Stafford could change places with Lovell in a demonstration of space rescue - but they met a pronounced rebuff. Borman's goal was a 14-day mission. He wanted nothing to do with any proposal that might threaten it. "Wally could have had all the EVA he wanted," Borman later said, "but I wasn't going to open the hatch." There were real hazards in trying to exchange pilots in mid- space, since the life support hoses would have to be detached and reconnected in a vacuum, leaving the pilots with only the backup system to depend on as they traveled between the two spacecraft. It might have looked great in the headlines, Borman added, "but one little slip could have lost the farm." Schirra and Stafford did not give up and turned to Low for help. The Deputy Director learned that Stafford, one of the taller astronauts, sometimes had trouble getting out of and back into the spacecraft in zero-g tests. Even the barest chance that this might happen during the mission made the whole idea seem too risky to Low, but he passed the crew's wishes on to NASA Headquarters. The consensus in the executive offices was that there should be no EVA on Gemini VII - VI-A. Ironically, Spacecraft 6 was the first vehicle to be specifically designed for EVA. Schirra had worked hard to get it out earlier, so he and Stafford could focus on rendezvous. He had done too good a job. As he later remarked, "I wrestled that out of there so well that I couldn't get it back in when we had the delay." While Gemini VII had rested on pad 19 awaiting launch, welders and repairmen had stood by. Borman and Lovell had barely started their booster-chasing exercise when Elliot See told them that pad cleanup had begun. The normal feeling of anticlimax after a launch was absent. If anything, spirits may have seemed too high. "Everybody was so excited you'd think they were going to launch the next day," John Albert recalled. The Martin crew found minimal damage to pad 19. Workmen wasted little time on normal painting or cleaning. Their objective was to replace critical instrumentation. The launch team got GLV-6 up and the spacecraft mated to it in one day, complete with standard procedures, tests, and reviews. In addition, VII's radar transponder was interrogated as Borman and Lovell passed over Cape Kennedy to ensure that it would answer VII's radar transmissions. After 56 hours of the Borman-Lovell mission, rapid progress in getting Gemini VI-A ready fostered hopes that it might fly on the eighth instead of the planned ninth day. A computer problem dampened these hopes briefly, but, with a new part installed, the final simulated flight test started and ended without problems. On 9 December. Mathews and Funk were convinced that the launch could be made a day early. On Sunday, 12 December, Astronauts Schirra and Stafford moved through the doors and into the couches of Spacecraft 6 for a second time. After a troublefree countdown, precisely at 9:54 a.m., their Gemini launch vehicle roared into action. The roar was quickly strangled. Gemini II's "hold-kill" seemed to be repeating, but this time more critically - there were two men strapped atop this sputtering rocket. At 1.2 seconds, an electrical tail plug dropped from the base of the booster and activated an airborne programmer - a clock in the cockpit that was not supposed to start until the vehicle had lifted off. Because there had been no upward movement, the valves closed to prevent fuel front gushing into the launch vehicle's engines. The malfunction detection system had sensed something wrong and had stopped the engines. One of the most suspense filled moments in the whole Gemini program followed. If ever there were a time to use the spacecraft ejection seats to get away from a cocked and dangerous rocket, this seemed to be it. Kenneth Hecht, chief of the Gemini Escape, Landing, and Recovery Office and long-time ejection seat specialist, was surprised when the crew did not eject, as they should have if ground, rules had been strictly followed. If the clock were right, then the vehicle had left the ground. Had it climbed only a few centimeters, the engine shutdown would have brought 136 tonnes (150 tons) of propellants encased in a fragile metal shell crashing back to Earth. There could be no escape from the ensuing holocaust. But neither Schirra nor Stafford had sensed motion cues; and Schirra, who as command pilot would have been the one to pull the "D-ring" for ejection, decided not to, despite the ticking clock. At the moment of crisis, the veteran test pilot remained calm. With no trace of emotion in his voice, Schirra reported, "Fuel pressure is lowering." Francis X. Carey, the Martin launch vehicle test conductor, was just as matter of fact over the radio circuit to the spacecraft. Just a hint of panic might have caused Schirra or Stafford to pull the D-ring. Schirra relied, with icy nerves, on his own senses. He knew GLV-6 had not moved, and he knew the clock was wrong. When the smoke had cleared and it appeared that the booster was not going to explode after all, up went the erector. Guenter Wendt and his McDonnell team hastened back to the white room they had so recently left. After checking on the cabin pressure and making sure that the crew had safetied the seat pyrotechnics, Wendt opened the hatches and helped the astronauts, their faces etched with disappointment, out of the spacecraft. Seamans had been listening in at NASA Headquarters in Washington. Once sure that the crew was safe, he went home. A call from Administrator Webb soon brought word that President Johnson was greatly disturbed by the failure. All was not lost, Seamans told Webb. Gemini VII still had six days in orbit - time enough, he hoped, to find the source of trouble and launch VI-A for the rendezvous. As expected, reporters clamored for details about the engine shutdown. Merritt Preston was picked to tell them what NASA knew and what it planned to do. Known to the press as a spacecraft expert, Preston could not be expected to know all the technical details about the launch vehicle and would be saved from having to guess. Although he winced at being placed on the firing line, his explanations at a news conference were well received and he was not pressed for answers. Reporters shared with Gemini officials the belief that it was just a case of a plug pulling out. The malfunction detection system had worked as it should, the crew had remained cool. There seemed every reason to believe that the launch could take place in four days. Aerospace engineers routinely examined the launch vehicle engine thrust-trace data. The firing trace looked normal at the beginning, but some strange squiggles farther along on the graph suggested that thrust had decayed before the plug dropped out. A call to John Albert caught him as he was leaving for a meeting to discuss plans for the launch turnaround. He detoured to get a copy of the graph, which he took to the meeting. A telephone call was immediately placed to the Aerojet-General plant in Sacramento. A detailed analysis tentatively spotted the problem in the vicinity of the gas generator. But the trouble itself needed to he pinned down. By 7 o'clock that evening - 12 December - the Cape Aerojet engineers were searching the engine, piece by piece. All through the night they worked, but to no avail. When Charles Mathews came by at 9:00 the next morning, their haggard and worried faces told him there had been no success. Just as he was asking what Aerojet intended to do now, an excited engineer came running in, shouting that he had the answer - a dust cover that had accidentally been left in the engine. Months before, in the Martin Baltimore plant, the gas generator had been removed for cleaning. When the check valve at the oxidizer inlet was taken off, Martin technicians put a plastic cover in the gas generator port to keep dirt out. Later that dust cap was overlooked when the unit was reinstalled. The relatively inaccessible location of the check valve - on top of the engine just under the tankage where it could not be seen and all work had to be done using mirrors and touch effectively prevented the errant cap from being discovered. Once the trouble was found, the gas generator was cleaned and replaced in GLV-6 on 13 December. It had suffered no damage, but a question still lingered: Could VI-A be launched in time to rendezvous with VII? At the time of the hangfire, recycling was expected to take four days, but within five hours of the failure, Elliot See told the Gemini VII crew that launch was targeted for the third day - 15 December63 - with a mighty effort to reduce the 96-hour recycle to 72 hours. It succeeded. The friendly target was still waiting patiently upstairs. One question remained unanswered and unanswerable. When Schirra refused to pull the D-ring that would have ejected the Gemini VI-A crew, was that a decision be alone would have made, or was that an indication that none of the astronauts would have used the seats? The feelings expressed by the only Gemini pilots who faced that decision leave a measure of doubt. Stafford's concern was the enormous acceleration - more than 20 g's - an off-the-pad abort required to throw the seat in a stable trajectory far enough from the booster to do any good. Even a mentally prepared astronaut might suffer severe injury. At best, Stafford believed, he would have been walking around for months with a crick in his back, like those who had ejected in similar high-impulse Martin-Baker seats. Of course, he would also be alive. And Schirra remarked. "If that booster was about to blow. . . . if we really had a liftoff and settled back on the pad, there was no choice. It's . . . death or the ejection seat." On 15 December 1965, the mood of those working on the rendezvous mission - planners, pilots, and ground crew - was one of high anticipation. If on this third attempt Gemini VI-A would cooperate and go into orbit, a truly significant world space "first" - rendezvous - might be chalked up. Russian endurance records had now been shattered in two successive American manned space missions, but achieving rendezvous would be navigationally significant to the Apollo program as well as important one-upmanship. Having a friendly target to approach, one that could point its transponder and talk back as Gemini VI-A called out its course and speed, created an atmosphere of confidence. At 8:37 a.m. Gemini VI-A rose from its pad. As if forcing it to move by will power alone, Schirra urged, "for the third time, go." A moment of wonder followed, as the launch vehicle seemed to shimmy. This shaking may have been only an impression; because of their recent experience, both pilots were highly attuned to movement and sound. At engine cutoff, Stafford checked the computer and got a reading of 7,830 meters per second. This told them they were on their way. Borman and Lovell in Gemini VII, passing near the Cape Kennedy area, saw nothing except clouds; but they soon learned from the Canary Islands communicator that the orbital parameters of VI-A were 161 by 259 kilometers. A few minutes later, as they flew over Tananarive, Malagasy Republic, they saw VI-A's contrail and got a brief glimpse of the visitors' spacecraft. They put on their suits and waited for company to arrive. The rendezvous profile rubbed "M equals 4" by the mission planners for convenience (the "M" had no special meaning)scheduled the catchup to VII during the fourth revolution of VI-A. 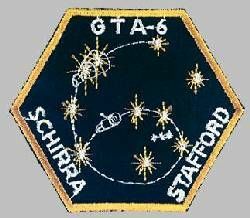 Schirra and Stafford faced six hours of maneuvering to reach Borman and Lovell. At insertion, the chase vehicle trailed its target by 1992 kilometers. The VI-A crew aligned the inertial platform to position their spacecraft for a height adjustment. Over New Orleans, after 94 minutes in space, Schirra ignited the thrusters to speed up by 4 meters per second. The perigee remained the same, but the acceleration kicked the apogee up to 272 kilometers. Gemini VI-A, being nearer to Earth and so moving faster, now lagged only 1,175 kilometers behind Gemini VII. Near Carnarvon, at 2 hours 18 minutes ground elapsed time, Schirra began a phase adjustment. This had a twofold purpose: to reduce the distance to the target and to raise the chase vehicle's perigee to 224 kilometers. He pressed the button to add 19 meters per second to his velocity. Over the Pacific less than half an hour later, Schirra turned his spacecraft 90 degrees to the right (southward) and ignited the thrusters to push Gemini VI-A into the same plane as Gemini VII. Now the distance between the two vehicles had narrowed to 483 kilometers. 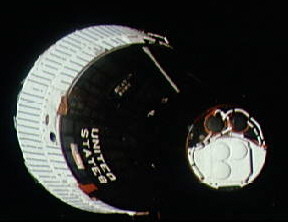 Three hours 15 minutes into the mission, Elliot See told Schirra that radar contact should soon be possible with Gemini VII. The VI-A crew got a flickering radar signal, then a solid lock-on at 434 kilometers range. Over Carnarvon, at 3 hours 47 minutes, the aft thrusters fired for 54 seconds to add 13 meters per second to Gemini VI's speed. The result was almost a circle, measuring 270 by 274 kilometers. In slant range distance, the two spacecraft were now 319 kilometers apart and closing slowly. Schirra and Stafford placed Gemini VI-A in the computer (or automatic) rendezvous mode at 3 hours 51 minutes into the flight. While the lower orbiting vehicle gained slowly on its target, Schirra dimmed the lights on, his side of the spacecraft to improve outside visibility. At 5 hours 4 minutes, he exclaimed, "My gosh, there is a real bright star out there. That must be Sirius." The "star" was Gemini VII, reflecting the Sun's rays from 100 kilometers away. Gradual catchup of the target vehicle lasted until 5 hours 16 minutes; Schirra prepared to make the last rendezvous maneuvers. The two ships were now close enough to allow Spacecraft 6 to thrust directly toward Spacecraft 7. He fired the thrusters and closed on Gemini VII at a rate of better than three kilometers every minute and a half. Schirra and Stafford briefly lost sight of Gemini VII when it passed into darkness but soon picked up the target's running lights. Schirra made two midcourse corrections spaced 12 minutes apart (at 5 hours 32 minutes and 5 hours 44 minutes). Six minutes later, at a range of 900 meters from his target, Schirra began braking his spacecraft by firing the forward thrusters. Soon he had no difficulty seeing Gemini VII. Fittingly, in the terminal stage of rendezvous, the VI-A astronauts saw the stars Castor and Pollux in the Gemini (Twin) constellation aligned with their sister ship. Then Spacecraft 7 flashed into the sunlight - almost too bright to look at. From a distance of 200 meters, it resembled a carbon arc light. Following the braking and translation maneuver, VI- A coasted until the two vehicles were 40 meters apart, with no relative motion between them. The world's first manned space rendezvous was now a fact. In Mission Control, the cheering throng of flight controllers waved small American flags, while Kraft. Gilruth, and others of the jubilant crowd lit cigars and beamed upon this best of all possible worlds. At 2:33 p.m., 15 December 1965, Gemini VI-A had rendezvoused with Gemini VII. Somebody said. . . when you come to within three miles (five kilometers), you've rendezvoused. If anybody thinks they've pulled a rendezvous off at three miles, have fun! This is when we started doing our work. I don't think rendezvous is over until you are stepped - completely stopped - with no relative motion between the two vehicles, at a range of approximately 120 feet (40 meters). That's rendezvous! From there on, it's stationkeeping. That's when you can go back and play the game of driving a car or driving an airplane or pushing a skateboard - it's about that simple. Borman and Lovell had been fascinated by the fireworks of VI-A's thrusters during braking and startled by the 12-meter tongue of flame. As Schirra and Stafford neared, there was a second surprise. Borman said, "You've got a lot of stuff all around the back end of you." Minutes later, during stationkeeping, Schirra told Borman, "So do you." Cords and stringers three to five meters long streamed and flapped behind both spacecraft. Rendezvous maneuvers had cost VI-A only 51 kilograms (113 pounds) of fuel. Schirra still had 62 percent left in his tanks. It had been easy, he said, and there was plenty of fuel for stationkeeping, flyarounds, formation flying, and parking the spacecraft in specific relative positions. Borman and Lovell were not so wealthy; Flight Control told them to stop maneuvers when the VII tanks dropped to an 11 percent supply. For more than three Earth revolutions, the two spacecraft stayed at ranges of from 0.30 meters to 90 meters. VI-A approached VIIto examine the stringers on one occasion. On another, they flew nose to nose. Schirra and Stafford swapped the controls back and forth because the Sun streamed so brightly through first one window and then the other. When it was time for Borman and Lovell to perform an experiment, Schirra and Stafford moved out 12 meters and parked. For some 20 minutes, in one instance, neither bothered to touch the steering handle, as the spacecraft remained stable in relation to its sister ship. On the first night pass,the two spacecraft faced each other at distances ranging from 6 to 18 meters. Schirra had worried about visibility during darkness, but it turned out to be excellent - docking light, handheld penlight, and even VII's cabin lights were clearly visible to him. Using what Schirra called his eyeball ranging system, the VI-A crew did an in-plane flyaround of VII, roving out to 90 meters. Believing this was too far away to be called stationkeeping, Schirra hurriedly brought VI-A within 30 meters. The astronauts were highly impressed with their ability to control the spacecraft. Velocity inputs as low as 0.03 meter (0.10 foot) per second provided very precise maneuvering. Because of this fine control, he and Stafford concluded that nuzzling into and docking with a target vehicle would be no problem. As the pilots' bedtime approached, Schirra flipped the spacecraft blunt-end forward and fired his thrusters to impart a small separation speed. Eventually, the crews settled down 16 kilometers apart. Borman, who frequently caught sight of Gemini VI-A in the distance. remarked to the Rose Knot Victor tracking ship communicator, "We have company tonight." After launch, rendezvous, and stationkeeping, Schirra and Stafford were utterly exhausted and hungry. They ate a good meal and went to sleep. When Schirra awakened with stuffy head and runny nose, he was glad that the mission was flexible, with the option of landing after only one day of flight if everything had been done. He and Stafford had achieved all their mission objectives, and the flight controllers would not be able to give too much more attention to Gemini VI-A, anyway. Gemini VII's fuel cell needed help, and Borman, Lovell, and Mission Control had to focus on its problems if the mission were to be able to last 14 days. Over "one," the communications circuit, came the strains of the pilots playing "Jingle Bells." The spirit of Christmas glowed - Gemini VII was about to begin its 12th day and VI- A, having demonstrated rendezvous in fine fashion, was going home. Schirra said, "Really a good job, Frank and Jim. We'll see you on the beach." He then flipped VI-A blunt-end forward and jettisoned the equipment section; retrofire followed automatically. Schirra placed the spacecraft in an inverted (heads down) attitude to see Earth's horizon. Nearing the 100,000 meter fringe of the atmosphere, Schirra set the bank angle at 55 degrees left and held it until computer guidance took over at 85,000 meters. The spacecraft threatened to overshoot its planned landing point. This had to be countered by banking first left, then right. Since the Gemini spacecraft obtained its greatest lift flying straight ahead, banking cut lift and shortened range. The crew turned the computer off at 24,000 meters, deployed the drogue parachute at 14,000 meters, and punched out the main parachute at 3,200 meters. Gemini VI-A landed about 13 kilometers from its planned impact point, recording the first successfully controlled reentry. For another first, they did it in full view of live television beamed from the Wasp via satellite transmission. As on his Mercury, flight, Schirra elected to remain aboard his spacecraft while it was hauled onto the carrier deck. Thus, on 16 December 1965, after 16 revolutions (and 25 hours, 15 minutes, 58 seconds), the world's first manned spaceflight rendezvous mission became a matter of record. Family: Manned spaceflight. People: Schirra, Stafford. Country: USA. Spacecraft: Gemini. Launch Sites: Cape Canaveral. Agency: NASA Houston. 1964 August 14 - . At a meeting of the NASA-McDonnell Management Panel, the problem of the extravehicular activity (EVA) chest pack size was discussed. - . Nation: USA. Flight: Gemini 6. Spacecraft: Gemini. At a meeting of the NASA-McDonnell Management Panel, the problem of the extravehicular activity (EVA) chest pack size was discussed. If stowed on spacecraft No. 6, it would take up space that would otherwise be available for experiments on that mission, and the same would be true on subsequent missions. A study was requested from McDonnell, as well as suggestions for alternative plans. One such alternative proposed was the storing of some experiments in the adapter section - but this, of course, meant that EVA would be a prerequisite for those experiments. Gemini Program Office (GPO) reported the substantial completion of all research and development testing of components. - . Nation: USA. Flight: Gemini 6. Spacecraft: Gemini, Gemini OAMS/RCS. 1964 September 23 - . Changes in the ground rules made to the Gemini-Titan 6 mission plan. - . Nation: USA. Flight: Gemini 6. Spacecraft: Gemini. Manned Spacecraft Center announced at a Trajectories and Orbit Panel meeting that several changes in the ground rules had been made to the Gemini-Titan 6 mission plan. One change concerned a previous assumption of a 20-day Agena lifetime; it was now established that the Agena would not be modified to provide this. As a result, greater emphasis had to be placed on ensuring spacecraft launch on the same day as the Agena, primarily by relieving the constraint of no Agena maneuvers. The restriction on using Agena maneuvers had been removed to increase the probability of achieving rendezvous within the few days that the Agena would remain an acceptable target. 1964 December 16 - . Launch Vehicle: Atlas SLV-3 Agena D.
Atlas standard launch vehicle (SLV-3) 5301 was erected on complex 14 at Eastern Test Range. - . Nation: USA. Flight: Gemini 6. Spacecraft: Gemini. This was not only the Gemini program's first Atlas, but also the first SLV-3 on a new complex. Tests began to validate the pad and its associated aerospace ground equipment (AGE). AGE validation was completed December 30, propellant loading tests in mid-January 1965. Testing ended on February 11 with a flight readiness demonstration. Atlas standard launch vehicle 5301 completed testing on complex 14 with a flight-readiness demonstration. - . Nation: USA. Flight: Gemini 6. Spacecraft: Gemini. 1965 March 10 - . Launch Vehicle: Atlas SLV-3 Agena D.
Gemini-Titan 6 should use the Agena primary propulsion system. - . Nation: USA. Flight: Gemini 6. Spacecraft: Gemini. McDonnell completed manufacturing, module tests, and equipment installation for Gemini spacecraft No. 6. - . Nation: USA. Flight: Gemini 6. Spacecraft: Gemini. 1965 June 15 - . Systems assurance testing of Gemini spacecraft No. 6 was completed at McDonnell. - . Nation: USA. Flight: Gemini 6. Spacecraft: Gemini. Following validation of the environmental control system June 16-19, the spacecraft was prepared for Simulated Flight Test which began June 22..
Atlas standard launch vehicle 5301 was returned from Hanger J to complex 14 and once again erected. - . Nation: USA. Flight: Gemini 6. Spacecraft: Gemini. Booster Facility Acceptance Composite Test was completed July 9.. The Simulated Flight Test of Gemini spacecraft No. 6 was completed at McDonnell. - . Nation: USA. Flight: Gemini 6. Spacecraft: Gemini. The spacecraft was cleaned up and moved to the altitude chamber, where it underwent phasing checks and was prepared for chamber testing. These activities were completed July 15, and altitude chamber tests were conducted July 16-21. The spacecraft was deserviced, realigned, and prepared for shipment to Cape Kennedy. 1965 August 4 - . McDonnell delivered Gemini spacecraft No. 6 to Cape Kennedy. - . Nation: USA. Flight: Gemini 6. Spacecraft: Gemini. Industrial area activities during the next three weeks included pyrotechnics buildup and spacecraft modifications. The spacecraft was moved to Merritt Island Launch Area for Plan X integrated tests with the target vehicle during the last week of August..
1965 September 9 - . Gemini spacecraft No. 6 was moved to complex 19 and hoisted to the top of the launch vehicle. - . Nation: USA. Flight: Gemini 6. Spacecraft: Gemini. The move had been scheduled for September 2 but was delayed by the presence of Hurricane Betsy in the vicinity of the Cape September 3-8. The Prespacecraft Mate Verification Test was conducted September 13-16. Preparations then began for mating the spacecraft to the launch vehicle. 1965 October 26 - . Thoughts on Gemini 6 - . Nation: Russia. Program: Soyuz. Flight: Gemini 6. Spacecraft: Gemini. 1965 December 16 - . Space race - . Nation: Russia. Related Persons: Korolev, Pashkov. Program: Voskhod. Flight: Gemini 6, Gemini 7, Voskhod 3. Spacecraft Bus: Vostok. Spacecraft: Voskhod, Gemini. Gemini 7 has the space flight duration record, and Gemini 6 has achieved the first rendezvous in orbit. Yesterday Pashkov sent a letter to Smirnov, asking that new series of Voskhod spacecraft be ordered as insurance in case of further delays in development of the Soyuz spacecraft. Kamanin believes he sees panic setting in with the leadership. The next day Kamanin attempts to call Korolev, only to find he is out sick. 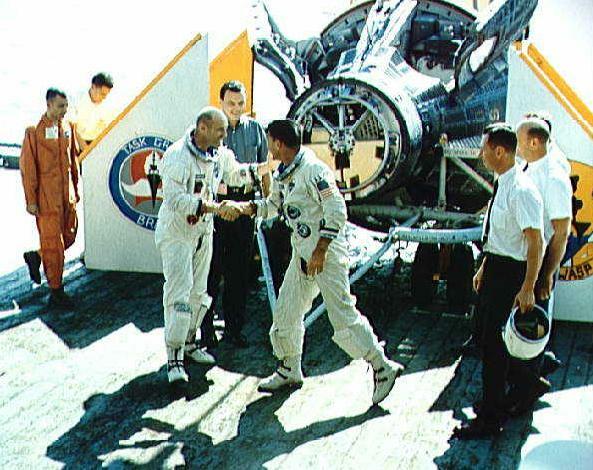 Landing of Gemini 6 - . Return Crew: Schirra, Stafford. Nation: USA. Related Persons: Schirra, Stafford. Flight: Gemini 6, Gemini 7. Spacecraft: Gemini. Gemini 6 splashed down near the aircraft carrier Wasp at 15:28 GMT. The capsule was lifted to the carrier deck with the crew aboard. When the hatch doors were opened, the spacemen gave the thumbs-up while the Navy band crashed in with 'Anchors Aweigh'. It was the first recovery carried live via satellite television. VPK Emergency Meeting - . Nation: Russia. Related Persons: Korolev, Pashkov, Smirnov. Program: Voskhod. Flight: Gemini 6, Gemini 7, Voskhod 3, Voskhod 4, Voskhod 5, Voskhod 6. Spacecraft Bus: Vostok. Spacecraft: Voskhod, Gemini. Smirnov calls the Military Industrial Commission and the Chief Designers together to consider Pashkov's letter and how to respond to the American Gemini successes. Korolev is ill and unable to attend. His deputies are unable to provide any firm schedule for completion and fight of Voskhod or Soyuz spacecraft. Soviet projections are that over the next year the Americans will fly manned missions of 20 to 30 days duration and conduct many military experiments from manned spacecraft. It is decided that a crash effort needs to be applied to Soyuz development. However no further Voskhods will be built beyond the five already being assembled, but those Voskhods will be dedicated to setting record duration flights of 15 to 30 days and conducting military experiments.